The answer to this question is ‘YES’ and ‘NO’. Yes, it seems that chia seed health benefits are overrated when it comes to their alleged weight loss properties. They also seem to be overrated in their supposed ability to lower heart disease risk. On the other hand, gram for gram, chia seeds are possibly one of the most nutrient dense foods known to man! In addition, they hold traces of Zinc, Vitamin B3 (niacin), Vitamin B1 (thiamine), Vitamin B2 and Potassium.It’s gluten and cholesterol free and the abundant fiber can feed the good bacteria in your intestine. Bacterial “happiness” is vital for health. At around 40% fiber, it’s one of the best sources around! For those who don’t eat dairy, chia seeds are considered to be an excellent source of calcium. 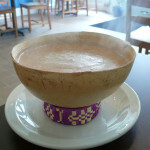 A single serving (28 grams or 2 TBS) gives 18% of the RDA for calcium. 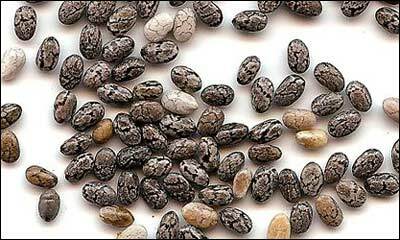 At around 14% protein, the seeds can also serve as a good protein supplement for vegans and vegetarians. Due to the fact that they can absorb 10 to 12 times their weight in water, expanding to form a ‘gel’, some feel that if you swallow them they will expand in your stomach and make you feel fuller for longer, stopping you over-eating. Ultimately this could help you lose weight. However, a non-human study (done with rats), showed that chia seeds can raise HDL (good cholesterol) and reduce insulin resistance and belly fat (in rats…). It seems that more studies are needed. The above results pertaining to chia seeds and weight loss don’t look promising.It would seem that just adding chia seeds to your diet is unlikely to have any effect on your waistline, but, then, there is no quick fix alternative to healthy lifestyle changes. HIGH IN OMEGA 3 FATTY ACIDS? Gram for gram chia seeds contain MORE Omega 3 than salmon! Does this mean you can substitute your oily fish with chia seeds? The answer seems to be “No”. The reason is that the Omega 3 in chia seeds is mostly ALA (Alpha Linolenic Acid). ALA requires conversion into DHA and EPA before your body can use it. Now this is the problem: Human bodies are not much good at converting ALA, so to get your DHA ( which your body really needs! ), you’d have to either eat oily fish, take fish oil or a DHA supplement. You’re just not going to get what you need from chia seeds. In fact, because our bodies can’t process ALA very well, all plant based Omega 3’s are hugely inferior to animal sources like fish. Tryptophan is used to produce several important hormones, one of which is serotonin. Serotonin can help fight anxiety and assists the making of melatonin – the sleep hormone. Your body can’t produce tryptophan on its own, it must come from a dietary source. Chia seeds can be such a source. A serving of 28 grams (1oz or 2 TBS) of dried chia seeds contains 202 milligrams of tryptophan making it the highest source out of all the seeds. 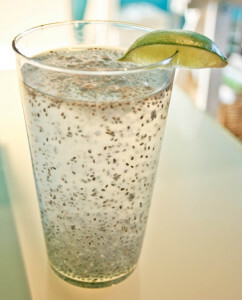 Because of their bland taste, chia seeds can be added to almost anything. 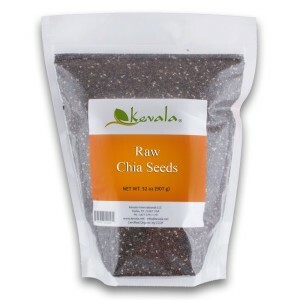 Whereas flax seeds need to be ground to utilize the nutrients, chia seeds do not. Eat them raw or tossed with salad, soaked in soup or juice or include them in baked products like muffins or bread. It’s easy to soften them first in a little liquid and then include them in a smoothie. Mixed with water and left to stand a few minutes will produce a “gel” which could be used as a natural thickener for sauces. If you’re allergic to mustard or sesame seeds, are on blood thinners or blood pressure medication, check first with your doctor before using chia seeds. Although high in nutrients, chia seeds are not recommended as a meal supplement, but rather as an alternative to processed grains such as white flour. About 1 and a half to 2 TBS of chia seeds twice a day.